During the 2004 Central States delegates meeting held in Collinsville, Illinois, it was decided that as part of the special Fiftieth anniversary issue of the journal, it would be appropriate to include some form of written tribute to a man who has for many years contributed to the journal's contents: Gregory Perino. As I have known Greg as a good friend for many years and have spent many hours with him in the field, I was given the honor of composing this tribute. 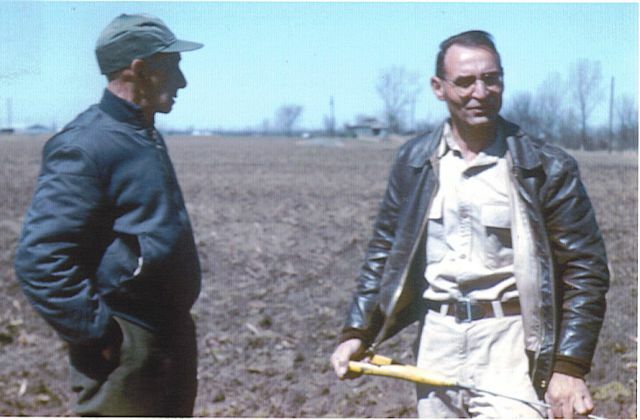 Photograph of Marian Dickson visiting with Gregory Perino at the Banks Site in Crittendon County Arkansas in the late 1950's. I first became aware of Gregory Perino when I joined the Illinois State Archaeological Society in 1963. His clearly written and absorbing articles in the Central States Archaeological Journal were a treasure for a kid with a passionate interest in artifacts and Illinois prehistory. The local library had very little to offer on these topics. As time went by, more and more of Greg's articles appeared in the journal and then in a series of books published by the Illinois Archaeological Survey. Outside of these two ventures, very little was being published concerning Greg's important fieldwork in those days. Ironically, 2004 should finally see a comprehensive volume of Greg's thirty years of fieldwork on Illinois. I met Greg in 1973 as a volunteer with the Northwestern University archaeological field school in Kampsville, Illinois. Dressed in his traditional khakis and greeting us with a smile, he immediately made us feel welcome and a part of the program. What was happening in Kampsville in those days was some of the most important interdisciplinary archaeological work being done in North America. After long days of field excavations, evenings would be filled by Greg's wonderful slide shows and lectures that often lasted two or three hours. He could just as easily have stayed home, put his feet up and watched TV, but he knew the majority of us were down there to absorb information. Tired as he sometimes must have been, he selflessly gave up his free evenings to share what he knew. This behavior was nothing new. In an article written by Raymond Vietzen regarding his expedition to Cahokia in 1948, Vietzen states, "We were presented to Mr. James Ramey, our host, and were met at his home by Mr. Gregory Perino and Mr. Joe Walta, who conducted us to the area to be explored. All these folks, especially Mr. Perino, were most considerate and did everything in their power to make our first visit to Cahokia an event to be remembered for the rest of our lives." Vietzen goes on to describe Greg's enthusiasm and excitement when artifacts were recovered. That enthusiasm was still solidly in place twenty-five years later as he taught a new class of field workers the many details of archaeological history in the lower Illinois River Valley. It was the same when he left Kampsville and spent several years as a field archaeologist with the Museum of the Red River in Idabel, Oklahoma. Today at age ninety, he retains that spark. When looking back at Greg's involvement with Central States, the Illinois State Archaeological Society and the Greater St. Louis Archaeological Society, it is remarkable to realize that he has influenced the entire history of these organizations. I was fortunate enough to recently acquire a rare copy of the very first ISAS journal. Listed on the back of the front cover are the original 76 founding members, and number 46 is Gregory Perino, 218 N. 34th Street, Belleville, Illinois. I believe Greg is one of the last surviving founding members of the ISAS. In April of 1954, when the meeting was held in Springfield, Illinois, to discuss the birth of the Central States Archaeological Journal, Gregory Perino was one of the seven in attendance. It was about that time that Greg began his contributions as a writer for the journal, a task that he continued for fifty years. The articles he wrote became a foundation for the journal's reputation as a source of important archaeological data. When the first of Greg's "Points and Barbs" editorials appeared in the 1970s, it immediately became one of the most popular features of the journal. More often than not, this was the first part of the journal that many of us read. Greg never hesitated to offer his opinions - and some were indeed "barbs." A prolific letter writer, Greg often voiced his observations, speculations, and opinions to the many friends he regularly corresponded with. Many of these letters were illustrated with careful drawings of new or unusual point types. Sometimes they might contain a little "barb" to the recipient. One of my personal favorites came after I mailed Greg a couple of points to check out which I acquired at a show. This was before he became a professional authenticator. His return letter began, "You better have your kids buy relics for you." This brings to mind something else Greg always conveyed: a great sense of humor. This might involve putting up with little pranks his field workers might try to pull off, like a laughing rubber skull poking out of the dirt. Sometimes, though, it was the other way around. Larry Kinsella relates a story about being on the receiving end of Greg's humor during one of Greg's last visits to the Cahokia area. "It was April 1990. Greg was in town to give a tour of archaeological sites for a group of amateurs and professionals from around Illinois. One person carried maps to plot sites, one carried a video recorder, some carried still cameras, and some simply came loaded with questions to ask about specific sites. I was in charge of the tape recorder. We had already visited a few sites along the Collinsville bluff. The weather was rather cold considering it was early April - the wind chill was in the mid 20s. in the air. Greg laughed and then teased me about that tailpipe snake for the rest of the day. After all, how many snakes are you going see with the wind chill in the 20s! Well, this is the way Greg's humor runs. The more he likes you, the more he teases you." Regarding Greg's skill as an archaeologist and author, there is a passage in a book review that I kept and which I find is a reflection of what many of us have felt who have worked with him. Michael Hoffman at the University of Arkansas Museum several years ago wrote this review of Greg's report on the Schild site published in the Illinois Archaeological Survey Bulletin No. 8: "Archaeological Ôfeel,' intuition, or insight is not just a talent some are born with; it is a skill developed through long years of field experience and handling artifacts. Thirty years of excavation and analysis in the lower Illinois River Valley has given Gregory Perino of the Gilcrease Institute in Tulsa great insight into the archaeology of the region." Hoffman goes on to describe Greg's affinity for comparative typology discussion and his ability to "Reel off" artifact categories in surrounding states and what their content was. In many discussions, Greg postulates types of artifact categories where names hadn't been used before. Most importantly, he puts it down in writing. Greg's ability to retain countless bits of archaeological detail and use it to this day is impressive, but his willingness to share this information with amateurs and professionals alike is what makes Greg unique. He has motivated generations of collectors, avocational archaeologists and future professionals to a degree that we are not likely to see again. Alas, the archaeological world has changed. The background that Gregory Perino was able to compile will not be obtainable. Our organization and the archaeological world are fortunate to have been the beneficiaries of his input and influence for as long as we have.